Finding time in an active lifestyle to stretch and recover from a day of work, sport training or cardio exercise can be challenging. Setting a goal for what you want to accomplish is good but: What is the plan to maintain athletic intent? To maximize my daily potential I use HOTWORX(HWX) fitness program at the end of a training day at Planet Beach. The fitness program is based on the fusion of infrared heat and isometric exercises. Here are 5 reasons to use HOTWORX. I like my personal space when I am sweating. Yoga was not always my favorite activity because I do not like overheating in a yoga room and feeling like the hot air is difficult to breathe. HWX uses infrared heat rather then hv/ac systems. The HWX room is made of Canadian Hemlock for a natural environment and has a sliding door for privacy. By feeling comfortable in the HWX space, the infrared heat gave me a more efficient experience. 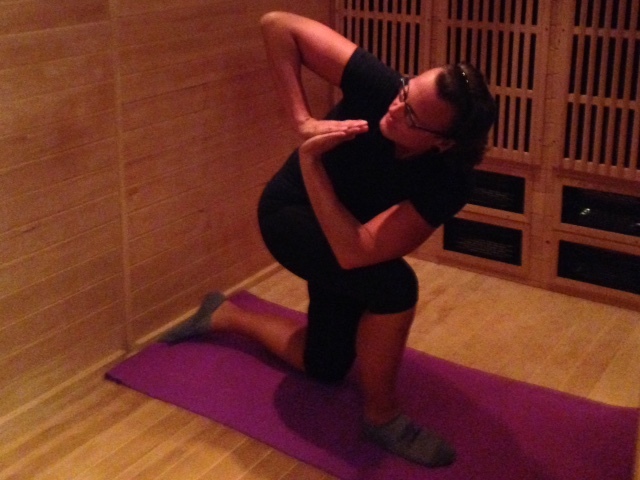 The HWX session provides a yoga video that offers a great stretch, isometric yoga exercises and cool down. I like that I am in the room by myself but the video makes me feel like I have support in my active goal. I freeze a half a bottle of water the night before to have available to me with water during my hot yoga session. Stretching is important before and after any activity. Before I discovered HWX I would go home after a long run or bike ride and take a nap in front of a fan to regain my energy. The HWX exercises are a way I maintain my bodies flexibility. If I am sore, I can give the muscles in question additional attention or less attention. The benefits of the HWX isometric exercises are muscle development, bone strength, increased metabolism and blood flow which leads to fat burn. Infrared heat aids in athletic recovery. Because the HWX yoga video provides a personalized experience; I feel more confident during and after the yoga exercises in reaching fitness results. The infrared heat environment and isometric exercises provide a more natural way to heat the body and to cause sweat for detoxification. I add pbHEAT lotion to intensify my sweat development to assist in flushing out unwanted impurities from my body. I have more energy by improving my circulation, cellular health and immune system. Knowing after a long day I will have a HOTWORX session of stretch, relaxation and recovery to look forward to is empowering. Having your body finish strong in your days tasks feels great! I remember a friend telling me for months to try the HOTWORK and I finally did it. I highly recommend trying the HOTWORX fitness program based on the fusion of infrared heat and isometrics to maintain athletic intent .